Considering that we've been living in the East Bay for more than five years and in our current house for almost three, you'd think we'd have gotten used to the way the seasons work around here. Even so, we're still surprised every year when the cherry trees in our neighborhood start blooming in early to mid-February. It always feels like we just recently started grumbling about the end of summer, which also seems to catch us by surprise every year. I sometimes feel that Thanksgiving and the whole "holiday season" that follows are all some kind of trick to distract us with food and celebration so that we forgot to mourn the end of the wonderful warm weather and summer produce. It's not a bad trick, anyway, and it seems to have propelled us all the way through winter, so that here we are at the other end. We've started our annual asparagus binge (we ate it nearly every day last week), and spent all day Saturday working in our garden (before we came inside to eat asparagus - along with our poached chicken with tarragon cream sauce and a delicious blueberry crisp - for dinner). 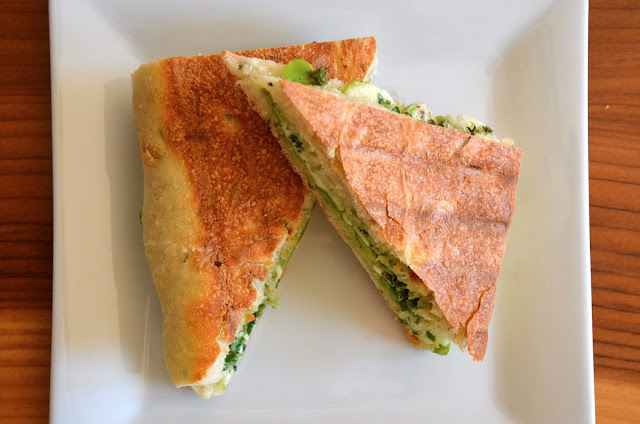 So, here we are, emerging from a bit of a hibernation on our blog with a fresh, green sandwich filled with another harbinger* of spring - the fava bean. It took us a while to shell those two pounds of beans, and then remove their skins, but it was totally worth it. Make this lunch on a weekend when you have a bit of time. We put favas on the sandwiches in two forms: a purée with parmesan and olive oil, and just fresh and simple. We topped all that off with a bright, chopped salsa verde and fresh mozzarella. Happy spring!